1896 The Khodynka Cup of Sorrows, also known as the Coronation Cup, the Sorrow Cup,or the Blood Cup,was made for the coronation of Tsar Nicholas II & Tsarina Alexandra Feodorovna. The cup bears the cyphers of Nicholas and Alexandra surrounded by a geometric pattern with the Romanov eagle on the opposite side. Good condition with some small chips on the rim. Very unusual to see this item in such great condition. Rare Imperial Russian antique. Guaranteed authentic. 7. AMAZING, I T IS 121 YEARS OLD ! 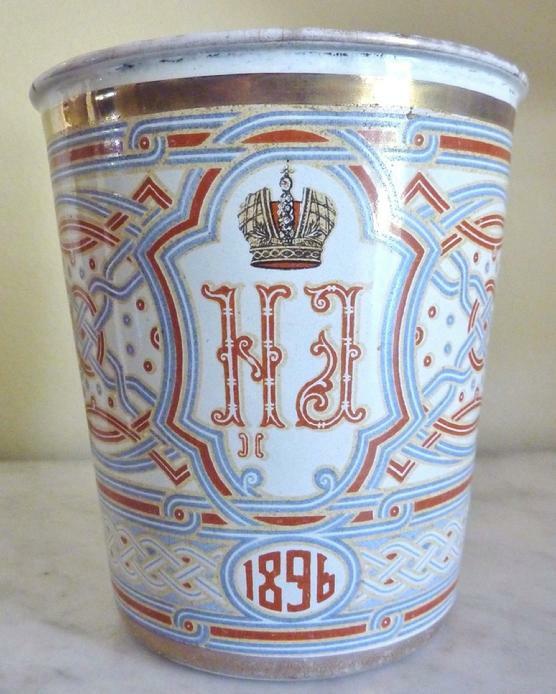 The beaker is among many that were distributed along with food presents and commemorative scarves to celebrate the coronation of Nicholas II, as had been the long-standing tradition. On the morning of 18 May 1896, over half a million revelers gathered on the ragged Khodynka Field in Moscow in anticipation of the presents and especially the commemorative cups (enameled tableware was still a great novelty at the time). That was far more than the field could safely accommodate, especially considering the many trenches and pits that dotted the plain in front of the Tsar's podium, because the entire area was normally used as a military training ground. In the confusion and panic that ensued, over a thousand people were trampled to death in what has become known as the Khodynka Tragedy. This event was taken as an omen of things to come for the rest of Nicholas' reign. The coronation cup became known in Russia as the Cup of Sorrows and the Tsar himself got the nickname of "Bloody Nicholas" - despite his best efforts to compensate the families of the victims. Most often, our merchandise is old and or used. Because of this, it is sold as found, the same as in any other auction. We will try to describe these items to the best of our ability and would not misrepresent anything intentionally. We list the defects, problems and imperfections we see on the items, but we can sometimes overlook something or make a mistake. We will admit that we are not experts on everything we sell so please look at the pictures for condition and email us with any questions before bidding if you have any. If you are unsure of your decision after you ask for additional information or clarification on an item, please do not bid. All items are sold "AS IS." No refunds and no returns. We are happy to combine shipping. From October 2017, every item shipped to overseas only by USPS Priority Mail Express International for $ 62.00. USPS not accepting Register Mail International ! С Октября 2017 года, пересылка в Россию и бывшие республики Советского Союза, только Экспресс Почтой $ 62.00.